Were you taught to not write or mark your books when you were growing up? Teachers especially stressed that the books loaned to us for class had to be reused the next year and the year after that. Strong words were spoken about the love and care of books. That love and care of books remains with me today and the memories of those teachers. Yet after decades of keeping my books pristine has changed drastically. In the 90s I came to appreciate and to buy mostly used books. Often I would open a book to see a personal note written on the flyleaf by someone gifting the book. This brought me into the scene of the giver and receiver. A privilege; almost like being invited to share a confidence. 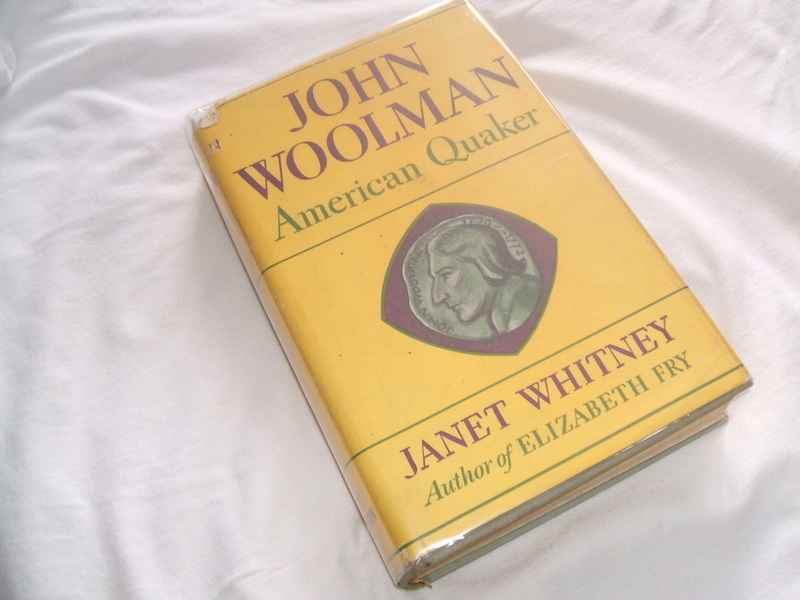 Pictured here, the John Woolman, American Quaker by Janet Whitney book, a first edition published in May 1942, is inscribed, To Cousin Gertrude, a Direct Descendent of John Woolman, with love and best wishes, from H…. Hutchinson Cook. The dots replace the writing I could not read. The first initial could be an H or a TH. I wonder about the relationship between these two cousins. I imagine the delight she felt with receiving this gift. He sounds happy to have found this book for her to read. 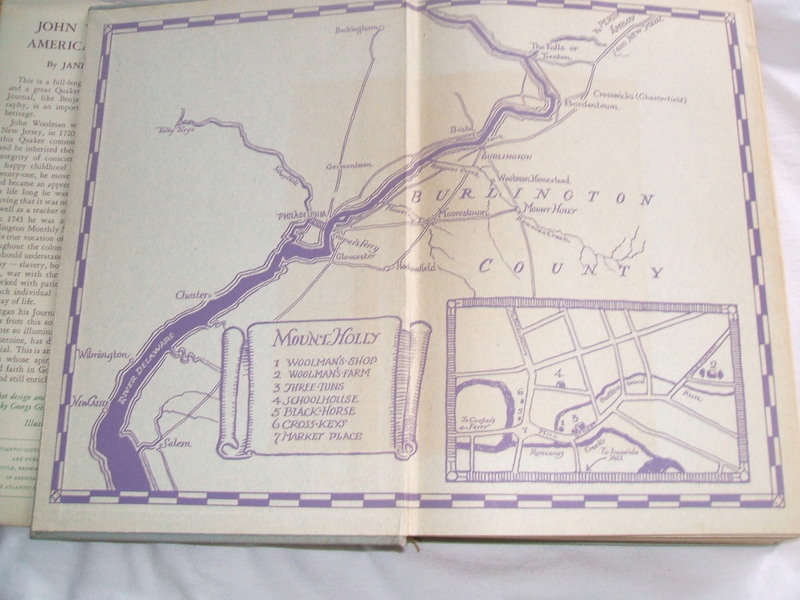 The original price in the book is $3.75. It is listed online for $33.00 to $85.00. 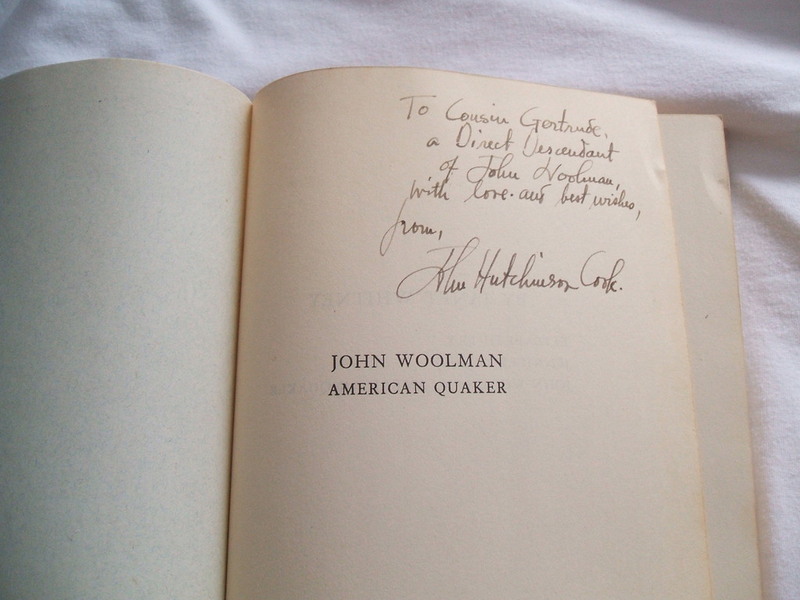 For serious book collectors the inscription would lower the value of the book. I think of it as adding value. More on this subject in the near future.